PEAK is a band that’s quickly on the rise. Given that the group only came together in mid-2016, their resume is impressive, quickly gaining fame after an ongoing residency at New York City’s American Beauty and an extensive Northeast tour. With wild improvisation fused into their genre-bending blend of rock, funk, and jazz, PEAK’s live band—featuring Jeremy Hilliard (lead vocals, guitar), Eric Thachuk(bass), Otis Williams (vocals, keys), and John Venezia (drums, vocals)—has established itself as a band to keep an eye on.With Hilliard at the project’s helm and serving as the band’s primary songwriter, the group is in good hands and sure to keep growing and refining its high-energy sound—some may be familiar with Hilliard from the past project he fronted, Turbine, which performed at huge nationally renowned events like Bonnaroo, Gathering Of The Vibes, moe.down, and many others. However, while PEAK is known for their exceptional live shows, the group has also begun to gain a reputation for their talented songwriting in its own right, as evidenced by their recently released debut album, Electric Bouquet. A phrase that keeps coming back to me is “songwriting is a contact sport.” I think it means that I love songs that have a certain really special quality to them and that when I’ve got one in my sights, a tiger by the toe to mix metaphors, I will wrestle with it for days, weeks, months, and sometimes years until I can pin it down. And I lose the battle more often than not. Each song on Electric Bouquet is a victory from those contests of will. My primary concern as a songwriter is how good a song is. Is it undeniably good? Style, to me, for better or worse, is secondary. That said, after I have a collection of songs that work together in some way musically and thematically and that meet my standards in terms of quality, I do my best to find how it all fits together stylistically. I’ve got it down to the dark, modern indie electro-funk; some plain good old Americana songwriting; and the occasional heavy riff to get the led out, as it were. Dave Brandwein as producer really helped in honing the stylistic vision. He also had an idea for the hi-fi yet warm vibe of the record from the get-go. Eric Thachuk on bass was crucial in helping flesh out some of the harmony and riffs to the songs, as well as carving out the perfect low end. He was also essential in helping program and construct a modern atmosphere. Otis Williams brought a wall of textures that form the sonic landscape. From his harmonic choices in the jams to the wide array of sounds he wrings out of the organ, not to mention all the synths that populate the songs, his sound is all over the record. Dale Paddyfote provided the funk foundation and the great harmonies you hear. 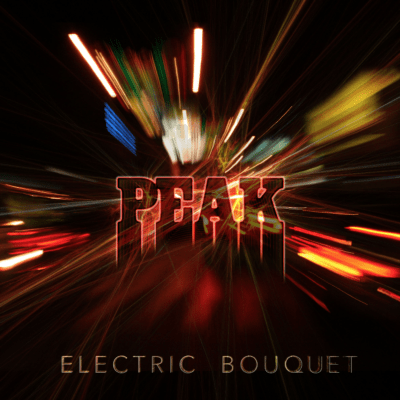 Listen to PEAK’s brand-new album, Electric Bouquet, below, and read on to hear Live For Live Music’s thoughts on this captivating collection of tunes. Closing out the disc with the country-tinged “Mama’s Got A Lot Of Love” cements Electric Bouquet as a far-reaching album that actually manages to nail each part of the sonic spectrum the band visits. It’s rare to see a band with clear strengths be so willing to experiment with their formula, and PEAK will win listeners who are willing to join them on this musical exodus easily. When the album ends, the real question is how soon can they get back into the studio and resume this multi-faceted assault on the edges of their sound? It’s rare that an album leaves listeners so intrigued about a band’s future, and Electric Bouquet speaks volumes for a bright future for PEAK. Keep an eye out for more from PEAK in the future, as they’re certainly a band on the rise. For more information about the band, head to the group’s website here.